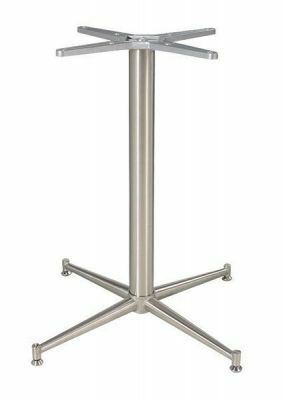 Brushed stainless steel table base with a four foot design. Suitable for use with table tops up to a maximum size of 800mm square or circular. Held in stock for a fast delivery. Stunning brushed aluminium café table bases for a variety of commercial applications, with four feet suitable to tops up to 800mm circular or square. Free delivery across the United Kingdom.